After a crazy 24 hours, sources close to President Trump say he is in a bad place — mad as hell about the internal chaos and the sense that things are unraveling. The big picture: Hope Hicks leaving is obviously a huge blow to him. Every time he reads about Attorney General Jeff Sessions, his head explodes. The staff is just trying to ride out the storm. Everywhere you look inside this White House, top officials are fighting, fomenting, feuding or fleeing, insiders say in conversations with us. 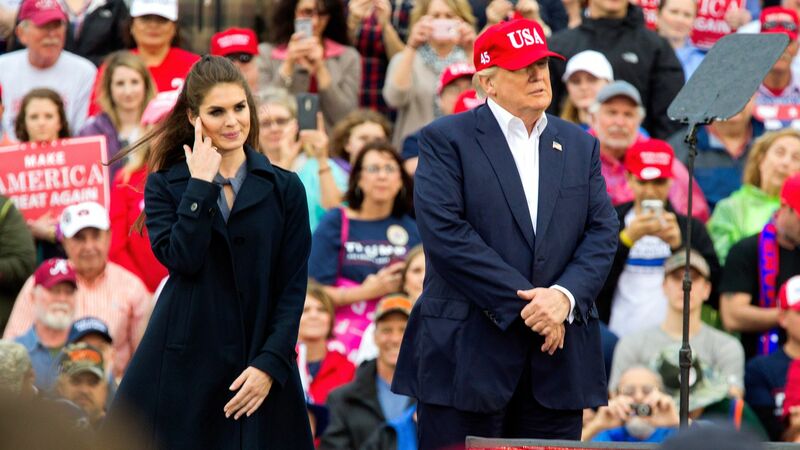 Hope Hicks — without question, the aide (family aside) with whom Trump is closest — resigned one day after she admitted in closed-door Hill testimony that she told white lies for the president. White House Chief of Staff John Kelly cracked down on Jared Kushner, stripping his top security clearance, and watching anonymous aides leak about and trash him, while offering no public defense of the president’s son-in-law. Jared, Ivanka and Don Jr. let it be known to friends they are furious with Kelly and his allies. Jared loses his internal P.R. guru, Josh Raffel, when he needs him most. Economic adviser Gary Cohn is at war with trade policy adviser Peter Navarro. Trump is at war with Attorney General Sessions. ... N.Y. Times lead story: "Trump Tears Into Sessions Over Russia Investigation." ... WashPost: "Behind the scenes, Trump has derisively referred to Sessions as 'Mr. Magoo,' a cartoon character who is elderly, myopic and bumbling." Intelligence chiefs use every chance possible to contradict the commander-in-chief on Russia. Be smart: Trump is in a bad, mad place, feeling ill-served and confined by staff. The people he genuinely enjoys and feels close to are gone (Keith Schiller), leaving (Hope) or getting pounded in the press (Jared). The restraints are almost fully loosened, and what staff sees in private is more public than ever. We have never seen top officials this concerned, defeated.